Help and advice on boiler controls when choosing a new boiler or heating system in the Peterborough area. Fitting the proper controls - Thermostatic Radiator Valves "TRVs" - Room Thermostats - Timers - Programmers - Weather Compensation - to any new or existing central heating system can greatly increase comfort levels and energy efficiency. Effective heating controls can increase the efficiency of a central heating system. They can also help you minimise energy consumption by ensuring each room is at the right temperature for comfort, while avoiding overheating. An electronic timer or programmer decides when the boiler is able to run. A seven-day timer makes it possible to set a different heating pattern for weekdays and weekends. Some timers allow different patterns for each day of the week; this can be useful for people working part-time or on shifts. These combine several of the basic controls and can also learn how long it takes for a house to heat up in different weather conditions. They also often allow for different temperatures to be set between day and night. These measure the temperature, either internally or externally, and delay switching on the central heating on milder days. This is best located in a living room or bathroom, which you'll probably want to be the warmest room in the house. The thermostat records the room's temperature, and if this is at or above the set level (20°C is usually adequate), stops the boiler from operating the central heating. A programmable room thermostat lets you choose what times you want the heating to be on, and what temperature it should reach while it's on. 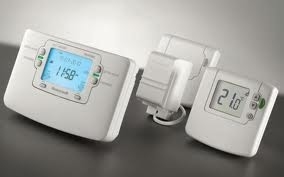 Some allow you to select different temperatures in your home at different times of the day and days of the week. These detect the local air temperature and switch individual radiators on or off, depending on how hot the room is. It's not a good idea to have a TRV on the radiator in the same room as the main thermostat as, if you alter the TRV, the thermostat will adjust itself to be in line with this local radiator. They usually have a fat valve at one end, marked with a * and numbers from one to five. The * setting is to protect against frost. This thermostat is strapped to the outside of a hot water cylinder near the bottom. It works by sensing the temperature of the water inside the cylinder, switching on the water heating when the temperature falls below the thermostat setting. Or use the links provided in the navigation table to go to the pages you require. Simply fitting the latest condensing boilers does not give the greatest degree of energy efficiency. Bigger savings can be made from installing the correct controls. Energy Efficiency qualified Central Heating Engineer.